Additions and corrections to the Rensselaer County, NY GenWeb Cemetery Database are very welcome. Information on this page was submitted by researchers wishing to add to, or correct, entries in the cemetery lists. To submit additions or corrections, please email them to me, Debby Masterson. If you have questions about anything you read below, please contact the submitter at the email address provided. Information submitted by David Akin. My name is David Akin, from Chautauqua County, New York. I noticed that information in your database is missing the date of birth for Justus Holloway AKIN Sr. Our family genealogy gives the date of birth as 13 October 1797 for Justus H. AKIN Sr and a date of death of 18 October 1867 (which is correct in your record). The dates you have for Justus H. AKIN Jr are also accurate. Information submitted by E. M. Bareis. BAREIS, Bertha E., died in 1866 at the age of 81y and is buried at Nassau-Schodack Cemetery in Nassau. BAREIS, John F.W., died in 1948 at the age of 70y and is buried at Nassau-Schodack Cemetery in Nassau. Bertha E. BAREIS was born on July 15, 1885 and passed away in 1966. John F.W. Bareis was born in 1878 and died in 1948. These people were my grandparents. Information submitted by Bill Claydon. All three of these are in one of the BARRINGER family plots of the Nassau-Schodack Cemetery (close to the middle of the cemetery). Their parents were George BARRINGER and Sarah KINGMAN. Willie K. BARRINGER should be Willis K. BARRINGER (the K is for Kingman, his mother's maiden name). He was born on November 10, 1873 and died on March 20, 1891. Fannie A. BARRINGER is not listed. She was born September 9, 1882 and died May 21, 1893. Information submitted by Mike Smith of Malta, Saratoga Co, NY. I have the following family members buried at the Beverwyck Cemetery, City of Rensselaer, on Washington Avenue across the street from the old high school. Information submitted by Gillian Wilson. Emma L. BICKFORD (1860-1903) was the wife of Henry Ellis FREEMYER. Emma was my great-grandmother. Charles A. BICKFORD (1850-1928), John B. BICKFORD (1865-1909), and Lewis BICKFORD (1849-1909) were all sons of Prosper BICKFORD and Mary Jane WHITE. Information submitted by Katherine J. Wilkinson. Irene E. BLOOMFIELD was not the wife of Chauncey E. BURDICK, as reported in the Interments in Rensselaer County Cemeteries database. Irene E. BLOOMFIELD was the wife of Sidney BURDICK, Chauncey E. BURDICK's brother. Information submitted by the Rev. Rita B. Nelson of Millsboro, Delaware. I was just up in Hoosick Falls, NY doing some genealogy on my family last month [July 2009]. You have a listing for Edward F. BLUTEAU buried in St. Mary's Cemetery in Hoosick. I have a picture of his gravestone and that of his daughter. Edward was married to my grandmother's sister, Abbie Louise DUPREY. Edward's mother was Virginia (maiden surname unknown), and his father was Charles BLUTEAU. They had one child, Virginia, who was known as "Vera", and you have her listed as well in the same cemetery. She was the spouse of Daniel J. SHANAHAN (who is also listed).... According to the Immaculate Conception Church records, my great-grandmother, Abbie TOOMEY DUPREY (born in about 1852, died 26 July 1900), is supposedly buried in that same plot, but we could find no markers. The two BOUGHTON entries for Denault Corners Cemetery should be HAUGHTON. Information submitted by Shirley Dilsworth of Grand Blanc, Michigan. I found a book in the Troy Public Library in 2004 that had burials in Old Lansingburgh Cemetery. Thank heaven someone did the book when they did, as when we visited the cemetery, I think there might have been five gravestones standing upright, perhaps three of these readable; the rest were on the ground. These are the old sandstone markers that do not withstand the test of time. Anyway, the book also listed William BRADSHAW's wife Elizabeth BRADSHAW, who died January 14 ,1852 at age 80. Thanks. Information submitted by Jim Breakey Graves. On your web page, http://www.rootsweb.com/~nyrensse/cemb14.htm, Interments in Rensselaer Co. Cemeteries", the first three line items are for the surname Breakey. Dr. vs. doctor, formerly at Fam. Bur. grnd. 2.5 mi. So./Renss. Can you offer any insights as to which data are correct? Information submitted by Jeannette Grosvenor. You have Jeptha BROWN born in 1792 and dying in 1827, age 52 years. I believe the age to be correct, but the math doesn't check out. I suspect he might be the father of Hiram BROWN, but there is no proof. He is buried in Pittstown. Information submitted by Jon Saunders of Omaha, Nebraska. The obituary of George E. BURDICK gives the correct death date for the individual as Monday, Oct. 10, 1977. Your online listing gives 1967 as his death date. Information submitted by Joyce Weaver. Corrections for the BURNSIDE listings at Mountain View Cemetery in Schodack Town. There is a stone that lists Nancy J. TAYLOR, wife of James W. BURNSIDE. Nancy Jane MERRITT was the widow of William or John TAYLOR when she married James Owen BURNSIDE, so both names have errors: Nancy Jane MERRITT, wife of James Owen BURNSIDE is correct. I also believe that Nancy's date of birth is about 1813 based on the ages of her TAYLOR children and her age given in the 1850, 1855, and 1860 censuses. James's dates do not appear on the stone, but his death certificate does list him as buried there. His date of birth is Feb. 24, either 1807 or 1809, and he died March 12, 1889. Also incorrect is the transcription of the name of Imogene BURNSIDE's husband. He was John CRIMM, not GRIMM. Thanks for making the space available for corrections. Nancy and James are my husband's 2ggrandparents, and Imogene (aka Emma) is one of their daughters. Adelaide BURNSIDE, wife of Silas CARGON, also buried there, is another daughter. Information submitted by Letitia Lombardelli. In the Oakwood Cemetery, 1898 listing, the parents of my GGGrandmother, Sarah CANNON LANE, are listed as Ibri and Dorcas CAMERON. But it should read CANNON. Thanks for letting me add this correction. Information submitted by Barbara Green. Calvin COLEMAN - His wife was Elizabeth BANGS. His parents were John COLEMAN and Martha HASEY. He was born 13 Sep. 1772 in Athol, Worcester Co., MA. John COLEMAN who was married to Susanna SPROAT was born 9 Sep. 1762 in Athol, Worcester Co., MA. John COLEMAN who died 27 Feb. 1824 (my records show 7 Feb. 1824) was born 22 Mar. 1730/31 in Malden, MA. His wife was Martha HASEY. His parents were John COLEMAN and Dorothy UPHAM. Phebe S. COLEMAN - Her middle name was SPRAGUE. I show her birth date as 6 Dec. 1782 in Athol, Worcester, MA. Her mother was Martha HASEY. Martha HASEY COLEMAN is not shown on the list, but I know she was buried in Hillside Cemetery, Stephentown, too. I've been there twice and seen her grave, as well as the rest of them. She was born 8 Feb. 1737/38 in Chelsea, MA. She died 7 Oct. 1818. Her parents were Samuel HASEY and Sarah UPHAM. Rowland COLEMAN was born 25 Jan. 1769 and died 7 Apr. 1845. His wife was Deborah HOLDEN. His parents were John COLEMAN and Martha HASEY. Rowland COLEMAN, Jr. - His wife was Elvira Sarissia CHAPMAN. Elvira Sarissia CHAPMAN COLEMAN was born 12 Nov. 1809. Her parents were Roswell R. CHAPMAN and Rhoda GRAY. Information submitted by Peg McCloskey. CRIST Robert, buried at Sacred Heart Cemetery in Castleton village, Schodack town, was born March 6, 1899 and died September 14, 1999. Information submitted by Veronica Meier. Information submitted by N. L. Rinsma. died 28 June 1978, Troy, Rensselaer County, NY. He was the husband of Gertrude (CARR) DAURIO, was buried next to her, and was the father of John V. DAURIO, who is buried nearby, also in St. John's. Information submitted by Jeanette Otis. I believe I found a typo on the http://www.rootsweb.com/~nyrensse/cemd2.txt page. The Phebe DAVIS listed as marrying Benjamin SACKETT has a death date of 12 Oct 1926. It should be 1826. For cross-references from your site with the correct information, there is a listing for Phebe SACKETT, wife of Benjamin SACKETT, who died 12 Oct 1826 on the cems1.txt file, and in the diary of George HOLCOMB, one of the entries is 13 Oct 1826 - Funeral of Old Widow Phebe SACKETT, wife of deceased Benjamin SACKETT. Died very suddenly yesterday morn. Moses HUNTER preached at the meetinghouse. Coordinator of the Saratoga County, NY GenWeb site. Information submitted by Margot Gifford. Name correction for Frank Garnrick 1860-1941 age 81y wife Amelia Crosprey 1859-1920. Name should be Carnrick. Franklin "Frank" Carnrick b. 1 Apr 1860 d. 16 Dec 1941 [son of Henry Carnrick 1824-1863 & Mariette Flint 1830-1914] interment Woodside Cemetery, Poestenkill. Griffin, William wife should be Martha Gifford, not Griffin. Ryan, John E. died age 72 yrs---Should be 78 yrs. Information submitted by Lucy Erskine. I discovered that the listings have my grandfather's name as Hall, which means he is not listed with the hundred or so Hulls for that cemetery, and that his wife Fannie Niles is down as a Hall, instead of Hull also. Please correct their names to HULL. Information submitted by Paul McNulty. There are no last two digits on John Hannon's death date. Information submitted by Mary-Elizabeth Hansen Joba. My mother, Marguerite BUGLI HANSEN, is buried in the Jens Christian HANSEN/Dagmar JUHL HANSEN plot in Elmwood Cemetery in Schaghticoke, Rensselaer County, New York. The Rensselaer County Cemetery Database gives her parents as Jens Christian HANSEN and Dagmar JUHL. They are not her parents; they are her mother-in-law and her father-in-law. She is the wife of John Alfred HANSEN, who is buried in the same plot. Marguerite's parents are Charles BUGLI and his wife Ellen, who are buried in Elmwood Cemetery in Quaker Springs, Saratoga County, New York. Thank you in advance for correcting this error. Information submitted by Tom Theilmann. My relatives are HERRINGTONs, and my neighbors were HARRINGTONS. While the gravestones have the correct spelling for Edith and Edwin, the records swapped the e for an a. Information submitted by Gene Stoddard. The inscription on Martin John HAYNER's gravestone is as follows: Elizabeth, his wife, died June 4, 1881, AE 61 yrs. She is identified as a daughter of Johannes (John J.) WAGER and Ann MORRISON, which may be incorrect. She is said to have been born 6 July 1813, which is in conflict with the gravestone inscription, which would imply that she was born about 1820. "The record shows Elizabeth WAGER LOCKROW to have married second Martin J. HAYNER [Sr] 13 June 1854. "At Elmwood Cemetery, Schaghticoke, Elizabeth WAGER LOCKROW shares a marker with Martin J. HAYNER Sr.... Your online data shows Elizabeth to be the wife of Frances M. HAYNER. This is in error. The grave of Frances M. HAYNER is indeed next to Elizabeth's marker, but Frances was her stepdaughter-in-law, Frances M. STARK HAYNER, the wife of Martin HAYNER Jr.
"Martin John HAYNER Jr, born 1845 Schaghticoke, NY, married Frances M. STARK, born 5 March 1844 Schaghticoke, NY, died Dec. 15, 1900 (Martin HAYNER Jr's reported date of death shown is questionable). Martin HAYNER Jr's grave is nowhere to be found and may be in Canada or some other location near one of his children.... I have been to the gravesite of Martin HAYNER Jr's wife, and it is she who died Dec. 15, 1900, not Martin. She is buried in the family plot of Martin HAYNER Sr. There is no evidence that Martin HAYNER Jr is buried there also, nor is there any physical evidence that any of their children are buried there." There may be a mistake on the year of death for Blanche H. Grogan (my great-aunt). She was born in 1895 but did not die in 1897 as listed. Perhaps it should be 1997. Information submitted by John Hills. Mrs. Wiley, the Pittstown Historian, made these corrections based on the Harrington Cemetery Records. These dates come from her review of the Harrington records and other records from the Pittstown Corners Baptist & Disciple cemetery. Interestingly enough, the same mistakes show in the 1850 motality schedule. The corrections, as made, fit Henry Bond's 1850 genealogy entry for the family. Information submitted by Linda Brown. I was looking up my HORTONs and found that you have a Fred Ernest HORTON buried in Brunswick, Forest Park, age 28, interment 21 June 1927. I have a newspaper clipping of his death. He died on 21 June 1927 and was buried a couple of days later, on 23 June 1927. He was the husband of Vera AGAN. His birth was 3 August 1898 in Stephentown. Information submitted by Kathleen House Petersen. Source book: Inscriptions of Graves from Mt. Ida Cemetery, Pawling Ave., Troy, NY by Mrs. Leland Wadsworth, Regent, Philip Schuyler Chapter, DAR. Found in Troy Room, Troy Public Library, Second Avenue, Troy, NY. [Albert House] *Hannah, his wife, died April 10, 1837, aged 34 years, 10 months, 10 days. [Albert House] **Sarah Elizabeth, his wife, died June 14, 1841, aged 20 years, 6 months, 17 days. "Albert A. House, died November 13, 1847 aged 34 years, 9 months, 18 days." Source microfilm: LDS Family History Library Microfilm 1,434,103, Mount Ida Cemetery, Troy, NY. "Interred November 13, 1847, Albert A. House age 36, died of hydraphobia; white, native, married." "House, Albert A. married to Sarah Elizabeth Johnson by Stephen Remington in presence of Margarett and Gitty Johnson, July 29, 1838. They were both of Troy." Information submitted by K. Petersen. The following three burials are additions to the database of the Mount Ida Cemetery in Troy, Rensselaer County, NY. The source for the first two items below is Inscriptions of Graves from Mount Ida Cemetery, Pawling Avenue, Troy, NY, by Mrs. Leland Wadsworth, Regent, Philip Schuyler Chapter, Daughters of the American Revolution. The source for the third item below is Burial Records, Mount Ida Cemetery, Troy, Rensselaer Co, NY: Names of those Interred. Both these books are in the Troy Room of the Troy Public Library, Second Avenue, Troy, NY. aged 34 years, 10 months, 10 days." aged 20 years, 6 months, 17 days." 3) "April 10, 1837 Albert House, child, 2 years." Information submitted by David G. Richardson. Thank you for all your work. It is a gold mine that I just found. Likely there was something wrong about the following entry in Interments. Isaac Humphrey was born 13 Jul 1778, and his second wife, Lucinda Udall, was born 11 Jul 1773; thus, if the above was correct, Ursula Humphrey was born 1830/1831 when Lucinda Udall Humphrey was about age 57. Everything I have for Isaac Humphrey's family is archived in my dave-humphrey in RootsWeb.com, and there are other Humphreys in my dave-humphrey ny file. It is easy to misread 1830 and get 1850, and there is a picture in findagrave.com. Ursula Humphrey was born 8 Jan 1811, a daughter of Isaac Humphrey and Lucinda Udall. The parents of Stewart Humphrey were Stephen C. Humphrey and Caroline M. Cushman. The wife of Isaac Humphrey was Mary Chapman, and findagrave has Samuel Humphrey in the Stephentown Baptist Cemetery. The wife of this Isaac Humphrey was Mary Wiswell. Christina Humphrey was nee Christina Cochran, and this John Humphrey was a son of Dr. John Humphrey. The second wife of Isaac Humphrey was Mary Chapman, and the parents of Isaac Humphrey were Isaac Humphrey and Mary Wiswell. Findagrave has Isaac Humphrey buried in the Stephentown Baptist Cemetery. I have Jane Wylie Humphrey born 25 Mar 1779 and died 1 Dec 1805. I cannot find her in the Stephentown Baptist Church Cemetery, which I referenced. Isaac Humphrey married his second wife 26 Oct 1806. Everything I have for Isaac Humphrey's family is archived in my dave-humphrey in RootsWeb.com. In the cemetery records, the Joseph C. HUMPHREY is really Josiah C. HUMPHREY (1784/1789--Apr 1836), buried in Stephentown Baptist Cemetery, son of Isaac HUMPHREY (see paragraph immediately preceding this one) and Mary CHAPMAN; husband of Esther DABOLL, who was a daughter of Samuel DABOLL and Esther CULVER. Josiah Humphrey's will was dated 8 April 1836 and was probated 27 July 1836; it named his wife Esther; sons Josiah W. HUMPHREY and Rensselaer S. HUMPHREY; and daughters Narcissa SMITH and Mary Ann. 1 m age 0-5y so b 1825-1830. Josiah C. Humphrey, his wife Esther and children are in my dave-humphrey file in RootsWeb. Josiah is a descendant of Jonas HUMPHREY of Dorchester, MA. The forenames Josiah (12) and Jonas (22) run in the family. Information submitted by Veronica Royall. My great-grandmother, Tillie KALINOWSKI, was born July 4, 1898. I have a copy of her birth record. Many other family members have confirmed this date. Her gravestone in St. Mary's Cemetery in Hoosick Falls, Rensselaer Co., NY also reflects this date. Your current database states her year of birth as 1893. Pitkoff was later Americanized to Pytko. Thanks for your time. 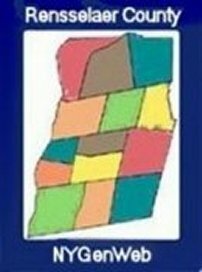 I really enjoy the Rensselaer County site. It has been a great help in my genealogical research. Kalvelage, Henry J., died 16 June 1973, wife Agnes M. Cusick; buried in Holy Sepulchre Cemetery in East Greenbush. 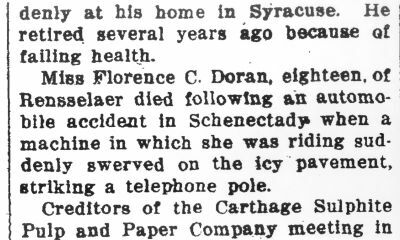 Cusick, Agnes M., died 18 Jan 1950, husband Henry J. Kalvelage; buried in Holy Sepulchre Cemetery in East Greenbush. But you do not list their daughter, Mary Catherine Kalvelage, 1964. This is a three-grave lot, and all three family members are together. Henry, "husband", is in grave #10; Mary Catherine, "daughter", is in #11, and Agnes, "wife", is in #12. I hope you will be able to correct this. John P. KIPP, 20 March 1884-22 February 1953, a cook in the 101MG BN 26 Division during World War I, and his wife, Mildred M. SULLIVAN, 1909-1961, are buried in West Hoosick Cemetery in the town of Hoosick, Rensselaer Co NY, along with their daughter Wilma Esther KIPP February 13, 1940-October 28, 1940, their son John P. KIPP 1942-1943 and their daughter Donna J. KIPP, 1947-1958. The wife of John P. KIPP and the mother of these children was Mildred SULLIVAN; the cemetery database identifies her correctly in some of the entries and incorrectly in others, as Mildred "Surdam". Alma Barber was born Sept. 1, 1863. Her husband was Albert Surdam. Her parents were Henry O. Barber and Emily Royce. Maud Surdam's parents were Albert Surdam and Alma Barber. Lewis H. Kipp's parents John G. Kipp and Juliette E. Thomas. John P. Kipp's parents were John G. Kipp and Juliette E. Thomas. William E. Kipp 1940- is still alive. Their parents are John P. Kipp and Mildred Sullivan. Frank Henry KOSTENBLATT was my great uncle. On the cemetery records, his parents are Oscar KOSTENBLATT and Natalie HILDABRANT. His wife was Josephine BROWN. Information submitted by Lorraine D. Weeks. This is just to note an error in your listing. It's regarding your listing of "KRECKER". It should be KREIGER. And the first name is listed as Fredrick, and that is misspelled; [it] should be Frederick. He was the Sand Lake doctor for many years, and I am a family member by a former marriage. FYI. Thank you. Information submitted by Kim Dingman. Hello I am a relative of Elizabeth B. Mayo.She died on 9-28-1976.Your site has her listed in both Mountainview and Horizon view cemetary.She is in Horizonview buried to the left of my Grandparents Frances and Mildred Dingman. Thank you for your time and consideration in reading this e-mail. Have a great day and God Bless. Information submitted by Mary McAuliffe Nigro. Here is a correction to the Rensselaer County Cemetery Database. 1883 Jan. 1 - Timothy McAuliffe - his age at death was 53, not 94. He was my great-grandfather, and I have the death certificate from Troy, as well as the death notice from the newspaper. I wonder if the age of 94 refers to his father's age at death. Information submitted by Chris Philippo. The surnames of Bessie, George and Thomas G. McGinty should be McGinity. Information submitted by Mary Bridger. My name is Mary Bridger, and I'm writing in regards to some of my relatives and their gravesites which don't seem to be right, according to my calculations. Jennie MICHAELS, date of birth 19 October 1900, date of death November 1961. Dorothy Hope KENYON, date of birth 1935, date of death January 1966. Byron MICHAELS, date of birth 25 December 1935, date of death 1993. If you could help me with any of this information, it would be greatly appreciated. I do not live locally; I live in Whitehall, [Washington County] NY. Thank you. Information submitted by Dorothy Cartwright Bacheller. I believe the ELIZAH MILLARD listed in the Rensselaer County cemetery list as deceased on 11 April 1855 at the age of 56 years 10 months was ELIJAH MILLARD, son of Elijah Millard (1755? - 1821) and Elizabeth Weeks Cartwright Millard (1770-1845). ELIJAH MILLARD, 52, appears in the 1850 Census of Berlin with his sister Catherine and his son Elijah, Jr., age 16. In 1855 Catherine and Elijah, Jr., now 21, are living together, but Elijah Sr. has disappeared. Information submitted by Joseph Nichols. The BIRTH DATE listed as "12 Jan 1938" for Sanford NICHOLS Jr. is actually his DEATH DATE, as shown on his tombstone. Grandson of Sanford Nichols Jr.
Information submitted by Bob Nooning, Sr. I have additions for the following records. They can also be viewed at my website with all sources attached at Rnooning@cfl.rr.com. NOONING Charles J. Jr. - died 25 Sep 1919, Sand Lake, Saint Henry's Roman Catholic Cemetery; on stone with Charles M. NOONING Sr. Parents were Charles M. NOONING Sr and Anna M. DEFREEST. Charles NOONING Jr. never married. NOONING Charles M. Sr. - born 11 Apr 1895, died 17 May 1971, spouse Anna M. DEFREEST, Sand Lake, Saint Henry's Roman Catholic Cemetery; cook, HQ, Co. 71, Infantry, World War I; parents were George Malcolm NOONING and Mary Frances [-?-]. NOONING William W. - born 18 Mar 1890, died 06 Nov 1948, Sand Lake, Saint Henry's Roman Catholic Cemetery; Corporal, Co. 71, Infantry, 11th Division, World War I; parents were George Malcolm NOONING and Mary Frances [-?-]; spouse was Alice H. WENDELL. You have an Alice O'BRIEN married to a Vincent LEBLANC, both listed as buried in Saint Mary's Cemetery, Hoosick Falls, NY. Alice's parents were Ida Jane DUPREY and Timothy F. O'BRIEN. Andrew PHILLIPS was born Nov 23, 1807 and died Dec 28, 1892; his wives were (1) Ann MOREHOUSE and (2) Julia Ann DAVIS. His parents were David PHILLIPS and Martha MOREHOUSE. David PHILLIPS was born March 3, 1777 (you have his death date March 12, 1868 twice - the 91 years is the correct one). Again, his wife Martha PHILLIPS was a MOREHOUSE. I have his parents as Joseph PHILLIPS and Dorcas VICKERY. Martha (MOREHOUSE) PHILLIPS - I actually have her death date as the 14th of Jan. 1828. Anyway, she was born Aug 16, 1781, and her parents were Andrew MOREHOUSE, Jr. and Judith LAKE. John PHILLIPS b Aug 16, 1799 - his parents were David PHILLIPS and Martha MOREHOUSE, and his wife's maiden name was VANDENBURG. Joseph PHILLIPS died Dec 4, 1871; he was born Dec 9, 1803, and his parents were David PHILLIPS and Martha MOREHOUSE. His wife's maiden name was DEUEL. Andrew PHILLIPS husband of Julia Ann DAVIS was another son of David PHILLIPS and Martha MOREHOUSE. He was born November 23, 1807 and died December 28, 1892. He was first married to Ann MOREHOUSE, daughter of John MOREHOUSE and Hannah IRISH. You have David PHILLIPS, born January 07, 1847, died Feb 1919. His wife was Jane Albertine HEERMANCE. David PHILLIPS was the son of Andrew PHILLIPS and Julia Ann DAVIS. Cyrus Clark PHILLIPS, another son of David PHILLIPS and Martha MOREHOUSE - I have him born Nov. 27, 1821. His wife's name was Mary HALL. Lorena PHILLIPS [Lorenda PHILLIPS] was another child of David PHILLIPS and Martha MOREHOUSE, born December 13, 1819. She married Stephen HEAD. Bertha PHILLIPS who married Adelbert MAXON - she was born April 5, 1877, and her parents were David PHILLIPS and Jane Albertine HEERMANCE. Robert R. PHILLIPS was another son of David PHILLIPS and Jane Albertine HEERMANCE. He was born March 06, 1895. His wife, Hazel H. DELAMARTER (you have her on the DELAMARTER page) was born July 13, 1896. Her parents were William H. DELAMARTER and Carrie HADLEY - listed right above her. Albert G. DENISON who died in 1865, was married to Katherine JONES. He was the son of Daniel DENISON and Isabell NILES. Benjamin G. DENISON's middle name was GREEN. That's because his mother was Sarah GREEN. His father was Jonathan DENISON. Caroline DENISON's parents were Benjamin Green DENISON and Abigail BABCOCK. Charles DENISON was married to Martha BRAMAN. His parents were James DENISON and Esther BROWN. D. E. DENISON was Daniel Eli DENISON. He married Sarah M. STREETER. His parents were Daniel DENISON and Elizabeth NILES. Daniel DENISON b 1791 was married to Ruena [--?--] and Elizabeth NILES. His parents were Jonathan DENISON and Sarah GREEN. David DENISON who married Abigail MAXON was a son of Jonathan DENISON and Sarah GREEN. Edgar DENISON was a son of Harvey Streeter DENISON and Ida A. GREENE. He had a middle name - Ray. Frederick P. DENISON was a son of Henry E. DENISON and Hannah M. GODFREY. George Pardee DENISON actually died in April, not Aug. - April 17, 1852. He was born Oct. 28, 1851 (this makes the 5 months work out, too). His parents were Henry E. DENISON and Hannah M. GODFREY. George T. DENISON was born Mar 17, 1795. His wife was Nancy NILES, and his parents were Griswold DENISON and Rhoda TIFFT. Gorham DENISON, born 1806, was also a Gorham N. His parents were Jonathan DENISON and Sarah GREEN. Henry E. DENISON's parents were George T. DENISON and Nancy NILES. He was born May 30, 1828. Isabella DENISON was Isabell NILES. James DENISON, who died in 1844, was a son of James DENISON and Jerusha CHESTER. Jonathan DENISON who died in 1833, was born May 17, 1761, son of Daniel DENISON, Jr. and Katherine AVERY. His wife was Sarah GREEN. Jonathan G. DENISON, born 1826, was the son of James DENISON and Esther GREEN. Katherine DENISON, wife of Albert G. DENISON, was Katherine JONES. Martha A. DENISON, born Apr 20, 1843, married Edwin D. CULVER. She was a daughter of David DENISON and Abigail MAXON. Nancy DENISON, wife of George T. DENISON, is Nancy NILES. Rhoda R. DENISON was born November 20, 1847. Her mother was Catherine JONES. Sarah DENISON, wife of Jonathan DENISON, is Sarah GREEN. Sarah B. DENISON's mother was Martha BRAMAN. Sarah M. DENISON's name was STREETER. D. E. was Daniel Eli. Sophronia DENISON was the daughter of Benjamin Green DENISON and Abigail BABCOCK. Susan E. DENISON's middle name was Esther. She was born Feb 13, 1821. Her parents were Benjamin Green DENISON and Abigail BABCOCK. Wheeler E. DENISON is actually Wheeler B. DENISON; the B is for Brown. His parents are Charles DENISON and Martha BRAMAN. He married Polly GREEN. William C. DENISON was born Nov 6, 1867. His parents were J. W. Tyler DENISON and Ann Eliza BREWERE. Information submitted by Lin Van Buren. The cemetery database has an entry for PHILLIPS, Dorcas, [relict of] Joseph PHILLIPS. This Joseph PHILLIPS and his wife Dorcas are indeed buried at the Log Meeting House Cemetery in the hamlet of North Schodack, in the town of Schodack, Rensselaer County, NY. Dorcas Phillips's gravestone does say that she died at age 70. However, the death date given in the cemetery database, 1815, is incorrect. I have seen and photographed these gravestones. The gravestone of Dorcas PHILLIPS says that she died on 22 March 1813. This date is corroborated by her will (source: Rensselaer Co NY Surrogate Court Will Book 4 page 247). This will was written on 23 February 1813 and was probated on 3 April 1813; therefore, the testatrix has to have died between these two dates. To view a full transcript of this will, click here. Timothy PHILLIPS, born 1 Jan 1765, died 21 June 1847; married Margaret LEWIS, born ca 24 July 1767, died 31 Jan 1856; both buried at the Log Meeting House Cemetery in Schodack. Anner PHILLIPS, born 28 Feb 1767, died 4 July 1851; married John DREW, born 16 April 1766, died 22 March 1856; both buried at the Log Meeting House Cemetery in Schodack. Abner PHILLIPS, born 4 March 1769, date and place of death unknown; married Sarah DREW, sister of John DREW; attended the Particular Baptist Church of Schodack [also known as the Log Meeting House] in 1810; appears in the 1820 US Census in Schodack; appears in the 1830 US Census in Fabius, Onondaga Co, NY; disappears after that; a Sarah PHILLIPS age 78 years appears in the 1850 US Census in Richmondville, Schoharie Co NY on page 286 dwelling 76 family 84 who MIGHT be Abner Phillips's widow, Sarah Drew Phillips. Roswell PHILLIPS [Sr.], born 2 March 1771, died 12 Sept 1838; married Magdalena SIMMONS (also known as Laney), born in 1778, died 20 June 1865; married 28 Feb 1795 at Greenbush Dutch Reformed Church; both buried at the Nassau-Schodack Cemetery in Nassau, Rensselaer Co, NY. John S. PHILLIPS, born 20 Feb 1774, died 9 Dec 1860; married 4 Feb 1793 to Esther WARING or WARREN, born 13 Sept 1776, died 20 Feb 1864; moved ca 1820s to Arcadia, Wayne Co, NY; both buried at the Main Street Cemetery, Newark, Wayne Co, NY. David PHILLIPS [Sr.], born 2 March 1777, died 12 March 1868; married "1797" [proof?] Martha MOREHOUSE, born ca 17 Aug 1780, died 14 Jan 1828; both buried originally in a family graveyard on their farm on Snyder's Lake Road in North Greenbush; both removed on 31 Aug 1978, with others, to Blooming Grove Rural Cemetery in North Greenbush, Rensselaer Co, NY. Joseph PHILLIPS [Jr.], born 23 May 1779, died 20 June 1866; married Chloe PATTERSON, born 12 July 1784, died 22 Oct 1857; married 14 April 1802 at the Dutch Reformed Church at Wynantskill, [North] Greenbush, Rensselaer Co, NY; father of groom named as Joseph PHILLIPS; father of bride named as Joseph PATTERSON; moved to Malta, Saratoga Co, NY, prior to 1810; both are buried there. James PHILLIPS, born 28 Feb 1782, died 26 Jan 1859; married Dorothy WEATHERWAX/WIEDERWACHS, born 27 Oct 1788, died 1 May 1875; married 14 Oct 1806 at the Dutch Reformed Church at Wynantskill;he is buried at Trinity Lutheran Church Cemetery in Sand Lake, Rensselaer Co, NY. Cyrus C. [Clark] PHILLIPS, husband of Mary A. [Adeline] [HALL]. David PHILLIPS [Jr.], son of David PHILLIPS [Sr.] and Martha MOREHOUSE, was born on 29 Oct 1817 in Greenbush, Rensselaer Co, NY, and died on 27 Dec 1908 in East Greenbush, Rensselaer Co, NY. He was married in November 1838 in Greenbush to Bathsheba MANVILLE (1818-1906), daughter of Jonas Smith MANVILLE (1790-1888) and Mary WHEELER (1797-1873). David PHILLIPS [Jr.] and wife Bathsheba MANVILLE had only two children to survive infancy, both of them daughters. These two daughters were Mary Louisa PHILLIPS (1843-1890) and Emma Elizabeth PHILLIPS (1849-1902). Mary Louisa PHILLIPS was married on 3 Dec 1863 in East Greenbush to her second cousin Clark A. PHILLIPS (1840-1911), son of Andrew W. PHILLIPS (1808-1880) and wife Julia Ann SLITER (1815-1883); this Andrew W. PHILLIPS was a son of James PHILLIPS and Dorothy WEATHERWAX. (Yes, there really were two different couples of similar age named Andrew and Julia Ann PHILLIPS!) Emma Elizabeth PHILLIPS was married on 8 Oct 1867 in East Greenbush to Augustus DeWitt TRAVER (1847-1928). Information submitted by Larry Spurgeon. - I do not who Harrison's parents are. My ancestral quest involved WAIT/WAITE lineage interests. Information submitted by Meredith DeBuse. Rosenberg Cemetery, town of Petersburgh, Rensselaer Co, NY, between hamlet of North Petersburgh and Vermont state line, now destroyed, from an earlier copy by Hilda ALLEN, and our notes (I think from the Pownal, Vermont Historical Society, but can't remember for sure). This is the Rosenberg Cemetery as it existed. Ryanna/Roena/Regina ROSENBERG was 2nd wife of Samuel ANGELL, and the mother of James C. ANGELL and John H. ANGELL, who lived in Pownal, Vermont. Ryanna was a daughter of Jacob ROSENBERG and Sally BROWN, born in about 1803. She is buried with her 2nd husband Josiah BATES in Pownal, Vermont. Her son John H. ANGELL ended up out in the Oregon Territory in 1851, died there in 1860. He was my 2nd great-grandfather. This is why you got a Washington state descendant to the ROSENBERGs! Information submitted by Dale Ryan. I was just looking over the cemetery listings. I believe the RYANs and possibly the BANKERs were moved to "Maplewood" cemetery on Plank Road, not Maple Grove. There is a Maple Grove cemetery, located in Hoosick. I know some of the BANKERs lived near there. Maplewood cemetery borders our farm. I have many generations of relatives buried there. I am the tenth generation to live on this property. My great ...... grandfather Michael VANDERCOOK purchased our land from Peter VAN RENSSELAER in 1770. The original deed still exists. We originally owned 6,600 acres, from what is now Pittstown to the bank of the Hudson River in the North Troy/Pleasantdale area. There are approximately 103 acres left. Information submitted by Bill Simmons. Please be advised that the S. SIMMONS 1814-1894 is Simeon SIMMONS, married first to Laura S. JOSLIN and second to Barbara Ann CRONKRIGHT of Poestenkill, N. Y. See the 1855 NY State Census for Sand lake and the 1880 US Census. He is my great-great-grandfather. Also, his father, Moses SIMMONS, and Marmre SIMMONS are buried in the same plot. Information submitted by Ellen Percy Miller. 9 years 4 mo's & 3 days. Dr. P. M. Armstrong was my great-great-great-grandfather who apprenticed physicians. In those days, they had to steal bodies in order to do autopsies and learn about the human body. This time they got caught. Two years ago the stone had broken off at the base and had been repaired with cement which covered the last line, "Where few Physicians rise." I would like to see the cement removed from this last line, especially since it is my understanding that cement eats limestone and the inscription would be lost. I would be willing to donate some money towards this. Can we do something about this? Information submitted by a contributor who wishes to remain anonymous. While researching my HANNAN family in the New York City area, I ordered and received a copy of a death certificate of a husband which shows that the man was buried in Schodack Landing Cemetery. Since he is not in your Rensselaer County Cemetery Database, I thought I'd submit the information to you. I also found him at age 14 with his parents and siblings in Schodack in the 1870 US Census, so I'm guessing that his body was transported north to be buried with his kin, even though he had lived in NYC for the previous 30 years or so, according to his death certificate. Source info: Death Certificate 10400, 1904, Manhattan, NY. Information submitted by Wayne E. Weatherwax of Westfield, Massachusetts. The following additional info will connect/correct some CRAPO / MCCULLUGH / WEATHERWAX information contained in these [main Rensselaer County Cemetery Database] records. married first Sarah CRAPO 1831-1861. Both are buried in Elmwood. They had one child, Mary F. WEATHERWAX, born in 1855. The date of death for Jacob WEATHERWAX is incorrect. He died in Westfield, Hampden County, Massachusetts on 28 March 1905. I found his obituary in the local newspaper as well as [confirmation of this death date] in the census / directory for the city of Westfield (I live in Westfield). Jacob's second wife was Alma L. MCCULLUGH 1845-1918 (note: also buried in Elmwood Cemetery in the WEATHERWAX lot). This couple married in 1863 and had one child, J. Ensign WEATHERWAX, born 19 January 1869. Appearing in the cemetery records directly above Alma L. MCCULLUGH are her father, Alexander MCCULLUGH 1792-1851, and her mother, Sarah EDDY 1789-5 Jan 1854. Information submitted by Kathleen Scheffler. Just felt I should drop you a note to let you know that Eunice BARRY who is buried in North Nassau Cemetery is a sister of Jonathan WILLIAMS, not his wife. The date on the stone is April 4, 1840, 76 years, from the DAR records for the North Nassau Old Cemetery. The proof that she is Jonathan's sister comes from Abstracts of Revolutionary War Pension Files, where it states that she gave an aff'dt on 12 Jul 1837 saying that her brother Robinson WILLIAMS srv in the Rev. Robinson was Jonathan's brother. There was also an aff'dt given by the sol's nephew Philip WILLIAMS son of sol's bro Jonathan WILLIAMS, made after that date in Nassau. Jonathan WILLIAMS's wife was Abigail BURR. Hope you don't mind the correction. Information submitted by John Moore. Ruth Wolford's date of death is incorrect. She died on October 24, 1989, not 1889. Thanks. Ruth Wolford was my grandmother's sister. Information submitted by Robert E. Wood.. I have the birthdates and expiration dates of Lina M. Wood and Riley S. Wood. Lina: Born March 1883, Died January 14, 1948. Riley S.: Born June 1876, Died January 1963. I am the grandson of Riley and Lina Wood. Information submitted by Jim Newell. This should be another of my YOUNGHANS members. His birth info would be Mathias H. YOUNGHANS, born Aug 23, 1819, West Sand Lake. You can see these, and more, on my family link which you still have under the Surname Registry category. Thanks.